Front Garden Design is very important for the overall appearance of your house. If finished and maintained well it can add greatly to the overall visual impact of your house from the road and increase its kerb appeal! You see your Front Garden Design every day as you enter and leave your house and if done well can lift your spirit and can be something you can be really proud of. Your back garden is out of sight, around the rear of your house but your front garden design is often on full view to all passer’s by. It is not necessary to have a wonderfully intricate garden design and it does not have to cater for a myriad of uses, from playground to dining. Sometimes, the simplest design’s work best. We just finished this design for a mature traditional house in Greystones, Co Wicklow, just to the south of Dublin. It plays off the symmetry of the architecture of the house creating a grand entrance, with a straight path from the gate to the front door flanked by symmetrical planting. The door is set off by generous granite steps with traditional topiary on each side. 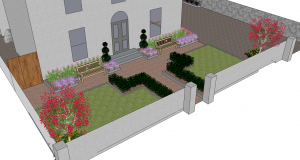 Two feature garden benches are set into the planting each side of the house to add to the visual appeal of the finished design. 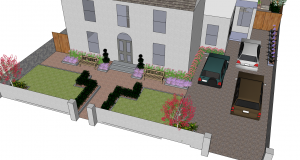 As with a lot of front gardens the clients want to be able to park up to 3 cars in the driveway which we have catered for by a gravel parking area to the right of the garden, which leads upto a side entrance into the house. If you want us to look at how you could improve your front garden, give Claire at Garden Design Dublin a call on 087 2334631 today!